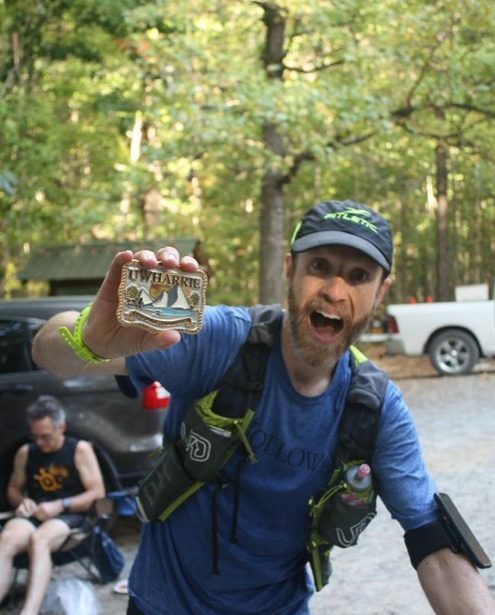 At the start of the Uwharrie 100, you depart Wood Run Trail Head and are swallowed up immediately by a thick, dark, mysterious forest. Underfoot are protruding rocks and a snake pit of tangled roots, all camouflaged by a layering of dead leaves. The 20.5 mile trail, which follows a figure eight route, will prove to be an almost unbroken minefield of trip hazards. The trail bucks and rolls underneath you and dips through several stream crossings, thankfully mostly dry this year. Three significant climbs break up the battle your feet are having with the rocks and roots: one steep, one long, and one steep and long. The hardest climb is called “Soul Crusher,” which suggests where your thinking goes the fourth and fifth time you are there. There is not much understory to the forest but the trees march off in all directions for as far as you can see: pine, hickory, oak, laurel, poplar, beech and dogwood. It’s a forest unique to the Piedmont region, distinct from either the mountain forests to the west or the coastal forests to the east. You never emerge from under the canopy except at one break where a powerline gets its due. It takes concentration to stay on track where the trees are thick and the trail changes direction every few steps. 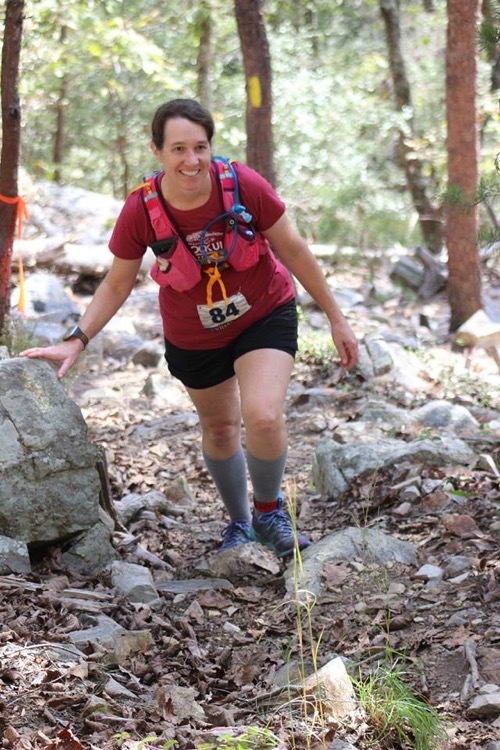 The word that characterizes the race and explains why runners are given 36 hours to finish the course is “unrelenting.” There are no extremes to face in the race, like high temperatures, massive climbs, miles of rock garden or slippery down slopes, but the challenging footing and the relentless roll to the trail are never relieved by smooth and easy sections. 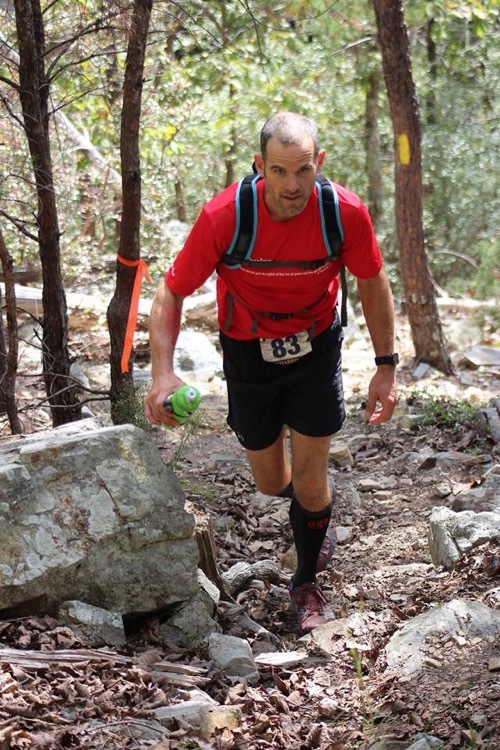 The three loops for the 100k runners (10,452 feet of elevation gain) and the five for the 100-milers (17,420 feet gain) get progressively harder as fatigue and foot pain inevitably grow throughout the race. 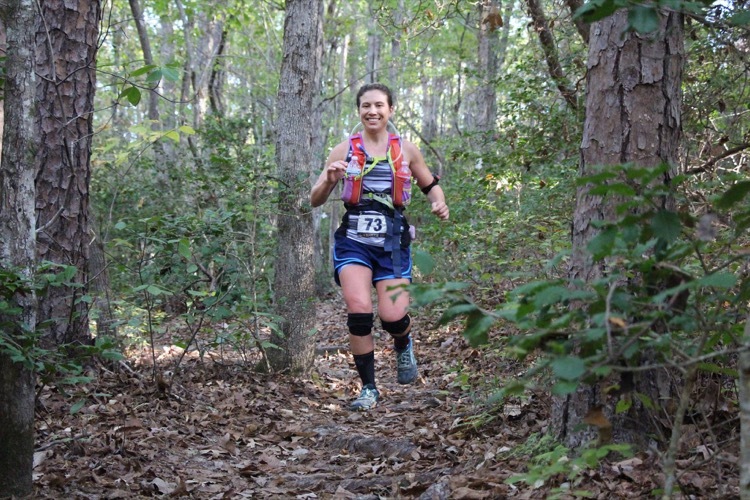 There is the physical challenge of this race which gives it character and heft and brings it in line with other tough Eastern races such as Eastern States, the Georgia Jewel, and Massanutten. But Uwharrie has a mystique and a vibe all its own, and to understand that, some background is necessary. The Uwharrie National Forest, located in the central North Carolina Piedmont, is the youngest of the state’s four national forests (1961) but its origins are ancient. The Uwharrie Mountains, which run through the forest, are one of North America’s oldest ranges. The soaring peaks that formed more than 400 million years ago with heights rivaling the Himalayas have been worn down over a vast period of time to the low ridges and small peaks (under 1,000 feet) of today. Native Americans inhabited the thick pine and hardwood forest for over 10,000 years, and one group, the Uwharrie (pronounced ooh-whari, not u-hari) left behind their mysterious and exotic name for outlanders to puzzle over. The largest nearby town, Albemarle, is named for one of the original counties established in early Carolina a mere 350 years ago. The Duke of Albemarle, George Monck, was one of the English lords granted the province of Carolina by King Charles II. The town of Albemarle recently gained notoriety as the birthplace of American Idol finalist Kellie Pickler. The race falls late in October so Halloween just adds to the already spooky atmospherics. Several skeletons (one of a dog) and various ghouls greet runners near the aid stations. Ghosts of the incredibly ancient mountains, of countless Native Americans searching for the flint the area was known for, and of English colonists tentatively exploring their strange, new lands all seem to hang in the air at night. One sign at a trail head read, “Now Entering the Land that Time Forgot.” It was no stretch to think you caught a glimpse of Big Foot just disappearing in the trees. 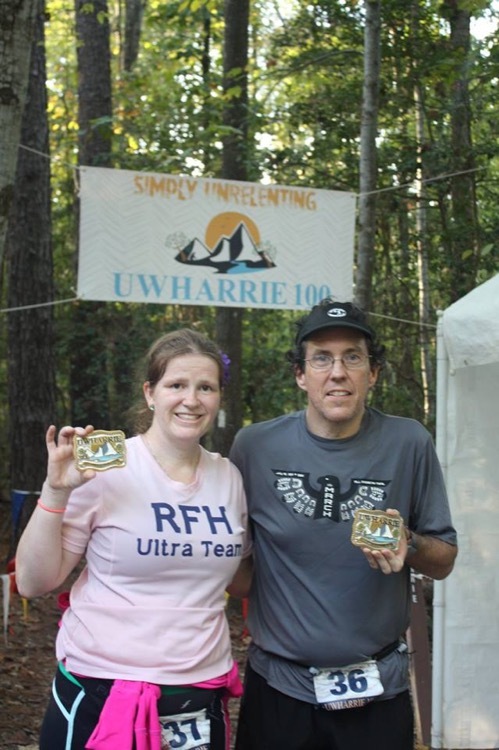 The other half of the Uwharrie experience was the over the top, family-style support runners received from race directors Dan and Amanda Paige and all their incredible volunteers. The Start/Finish aid station, the Crossroads in the middle of the course, and Kelly’s Kitchen at the far end of the course were elaborate field kitchens which surpassed anything I have ever seen in years of ultrarunning. A quick and very incomplete list of the fare would include pierogis, hotdogs, hamburgers, grilled cheese, quesadillas, meatballs in marinara sauce, veggie burgers, pizza, paninis, waffles, bacon, brownies and cookies on top of all the usual full array of ultra drinks and snacks. Add in soup choices of miso, ramen, chicken noodle, potato, lentil and plain broth and let’s just say that you were more likely to get killed by Big Foot than that you were going to die of starvation out there. The run up to the race was also notable. The website carried all the necessary information, and a split chart posted there was invaluable in getting a realistic idea of what to expect. There is high quality video there and info about a series of training runs. At packet pick up, runners discovered handwritten notes on the back of their bib numbers and Amanda was there to greet each runner and get to know them. Not surprisingly, the pre-race dinner was excellent. I went back for thirds. 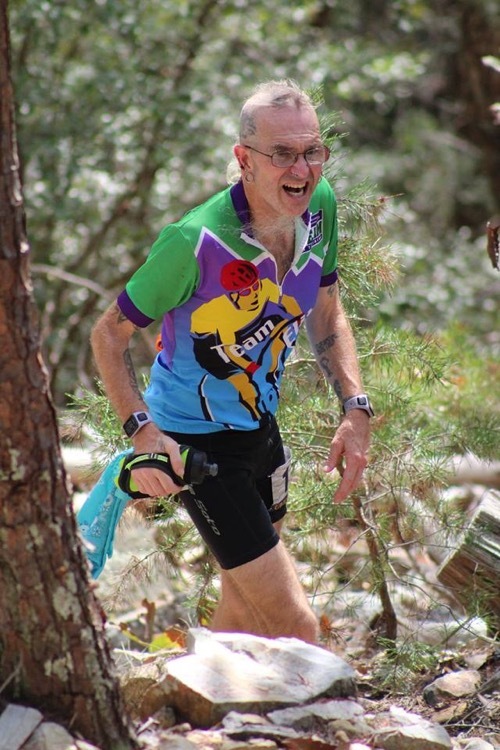 During the race, Dan appeared every time I finished a loop and seemed to be pulling for me along with all the other runners. And I would be remiss if I didn’t acknowledge the two runners who gave me a hand on the final loop when I was fading and falling asleep at every step. One handed me a baggy full of gummy bears and instructed me on their proper use. Another stopped, removed his hydration pack and pulled out a full bottle of Heed. He handed it over, no questions asked. Without their help, I might still be asleep somewhere on that trail with Sasquatch pawing over me instead of being snuggled up at home back in California with my super cool, Dennison, Texas, belt buckle. 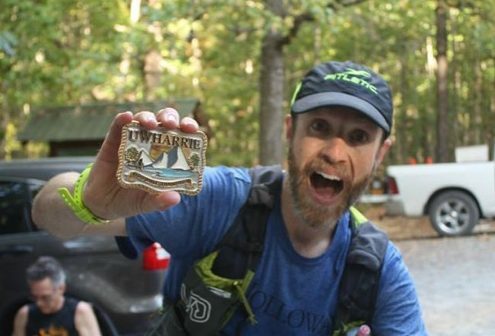 Plan on the Uwharrie 100 for 2018. 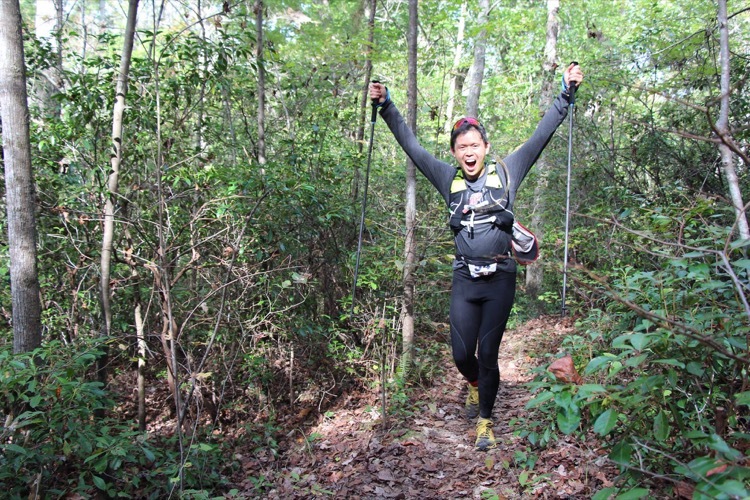 It will give you a jump on Halloween that is unsurpassed and an unforgettable ultra experience. See you in North Carolina. Is this article in an issue of the magazine? I ask because I know someone pictured and would like to purchase the issue if it is in print. This is just online, sorry.